The Scream (Norwegian: Skrik, 1893) is an expressionist painting by Norwegian artist Edvard Munch. The Scream has been the subject of much historical analysis attempting to explain its vivid and unusual content. According to Munch's diary, the inspiration for the painting stuck him one day as he saw a "blood-red sky" and stood on a bridge "trembling with anxiety — and I sensed an infinite scream passing through nature." Although the main figure in the painting also stands on a bridge under a bright red sky, the figure is not meant to represent Munch. Some art historians posit that the figure was inspired by a Peruvian mummy which Munch and fellow artist Paul Gaugin saw at a Paris Museum exhibition in 1889. Historians also attribute the unusually bright red sky to the dramatic atmospheric conditions caused by the 1883 volcanic eruption of Krakatoa. Contemporary accounts report that bright red skies were a common sight in Europe and North America for months after the eruption. The painting has been the target of many high-profile thefts, including an embarrassing heist on February 12, 1994, the opening day of the 1994 Winter Olympics in Lillehammer, Norway. Four men smashed windows to enter the Munch Museum, ripped the painting off the wall and left a note reading "Thanks for the poor security." Museum authorities were harshly criticized for the lax security protecting the painting, especially after a police investigation revealed the theft took just 50 seconds and was done with basic tools. The painting was eventually recovered after a complex undercover operation undertaken by Scotland Yard's "art squad." An even more daring heist occurred in 2004 when armed thieves pulled the painting off the wall in broad daylight during museum hours. The thieves were photographed fleeing the museum with the canvas, but were not caught. The painting was recovered two years later. Norwegian authorities have expressed puzzlement at the continued thefts since the painting is so widely recognizable that it would be nearly impossible to sell. 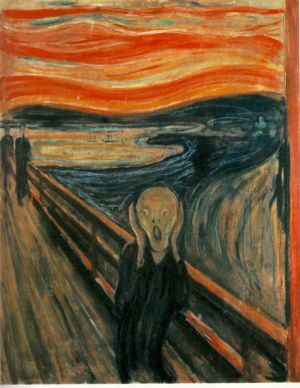 As one of the most recognizable paintings in the world, representations of The Scream can be found on thousands of merchandised items, particularly T-shirts and posters. It is also one of the most-often parodied works of art in the world.